Next week is big for us: S starts Kindergarten. Her birthday is just before the deadline, and since we're year-round she'll actually be starting at four years of age, before turning five the second week of school. For the last, well, her entire life, we have gone back and forth on keeping her in the grade that she qualifies for based on the September 1 cut-off date knowing she will be younger than most of her peers, or holding her back one year so that she can have another year to potentially be on the same page developmentally. There was a lot to consider, and I read and researched and asked for opinions from people with late summer birthdays who were the youngest in their grade, and from those who were the oldest. Ultimately, only time would tell if she would be ready to start the year she qualifies for, or if we would need to wait. She went to preschool last year and her readiness and emotional and social maturity there factored heavily into our decision to start Kindergarten this year. I know she will thrive with the level of engagement she'll have there. I don't doubt that she will make friends. She's had her outfit planned for the first day of school for weeks. We've bought school supplies she doesn't even need to take, and enough hand sanitizer to keep her class supplied through winter. She's a critical thinker and anxious to learn. She soaks up knowledge and asks the questions that have the potential to get her farther than any set curriculum. There's a part of me that knows we're not quite ready, though. We just went in for Kindergarten testing. Our district uses it as a benchmark, essentially, to assess where each child falls in math and reading at the beginning of the year and throughout. After meeting with her teacher and completing the necessary testing, we walked around the school to learn where the bus would drop her off and pick her up each day. Here's the thing: in all the years of figuring out when she would start school, I knew I would be the one to take her each day. Whether I drove or we lived close enough to walk, the plan was always for me to be the one to get her to and from school each day. We live far enough from her elementary school to ride the bus. We've spent the last year watching it drive through our neighborhood a few times a day, never thinking she would ride it. Yes, it would be convenient. Not having to get three kids ready and out the door an hour earlier than we're used to sounds fantastic. I wouldn't complain about not having to watch the clock to make sure we leave on time, leaving room for meltdowns, lost shoes, and diaper changes every afternoon. And not having to drive on icy, usually un-plowed roads come January? Why am I not begging to sign up? Because buses freak me out. The thought of having my child at school, away from me, every day does a number on me, but the idea of not being the one to drive her to and from is almost worse. I need to know where my babies are. I need to know that they are safe. The responsibility I have to care for them is not something I take lightly; mix that with my anxiety and perhaps slightly more elevated than normal fears, and you see why I would have been happy to get all three kids buckled into their carseats in a snowstorm. As anxious as I am, and as diligent as I am in not conveying that to her, S is anxious to. She has worries about the bus and school all her own. For that reason, and for mine, we decided it's best to face our fears and at least try riding the bus for a month or so. I'm not thrilled about the idea, but we presented it to her matter-of-factly, and not as an option we'd rather not choose. She's been getting used to the idea for quite a few weeks now, but I knew that seeing exactly where she would be getting on and off the bus made it very real. Once we were home from Kindergarten testing, I could tell that the idea was really bothering her. I asked her if she was nervous or upset about anything. "I'm scared to ride the bus. Why doesn't it have seat belts? That's not safe. The bus isn't safe, Mom. I'm really scared." I googled and offered up the best explanation that I had. I assured her that she would be safe. She still questioned it. I picked her up and hugged her, and told her how much I want her to be safe. I told her that, if I could, I would keep her home with me every day and never go anywhere without her. But then she wouldn't have the chance to go to school and meet new friends. She wouldn't get to experience the things that school has to offer, experiences that will help her learn and grow. I told her that it's hard for me to trust other people to keep her safe, but that I do trust them and the bus drivers and teachers will do everything they can to help her. I reminded her that she will need to be brave to ride the bus, but that being brave doesn't mean you aren't nervous, and it doesn't mean you can't ask for help. I hate that I can't ensure that my children will be completely safe all the time. I don't love sending them out, relying on others to help protect them, comfort them, teach them. That's my reality, though. It's most of ours. I will send S on the bus next week, trusting the kindness of others and relying on them to do their job to ensure her safety and peace of mind (and I will try really hard to not drive behind the bus.) I will be waiting at the bus stop when she gets home and I think we will both feel equally relieved and very proud of her. Can we all be a little more conscious when interacting with others? Can we all make more of an effort to help, to listen, to calm? Because when you think about it, we're all interacting with someone else's baby- no matter how long it's been since they actually fit that description. Let's treat each other like we want our children to be treated. Deal? And while we're at it, let's remind ourselves to be brave. 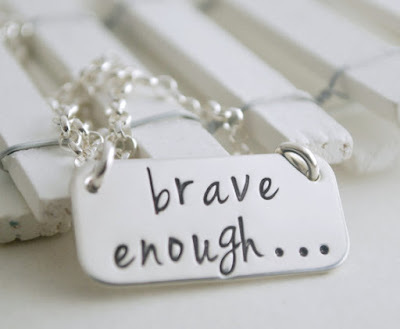 Bravery doesn't mean something isn't difficult. It doesn't mean you don't cry. It doesn't mean you don't ask for help. It means you face your fears and keep pushing through when things are hard. Now I'm off to find a bracelet fit to remind my soon to be Kindergartner just how very brave she is. And maybe get some chocolate for myself.